Your subconscious mind holds the key to getting over a toxic lover! finally getting over that toxic lover!!! 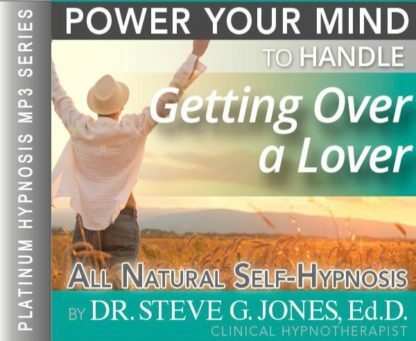 The Getting Over A Lover Hypnosis MP3 can help! It’s easier than you think. Steve G. Jones, Ed.D., Clinical Hypnotherapist, charges $1,500 for a custom recording and $25,000 for a one-hour private hypnotherapy session at his office. but you can get all the benefits for this low price. Simply listen to the Getting Over A Lover Hypnosis MP3 audio every night as you go to bed for three weeks and feel the changes happening in your life. You will feel more empowered, more in touch with your true self, and you will truly know that your goals are within your reach. Getting Over A Lover Hypnosis MP3 uses the same hypnotic technique he uses with busy professionals, Hollywood actors, and people like you who are ready for a positive change NOW! And as you relax deeper and deeper and more deeply relaxed, you realize now just how powerful you are. You are a wonderful person. You are a very wonderful and powerful person. And you realize that the past is the past and you let that past go because you are focused on the future. You are focused on a beautiful, wonderful future, that’s right. You are very focused on creating a beautiful future and you look to the future and you see yourself another wonderful relationship, more powerful and wonderful you had imagined. Perhaps this is a relationship you share with another person or perhaps this is a relationship that you develop with yourself. Seeing all the beauty and all the wonder in yourself and desiring to spend your time expanding your horizons. Whatever the case may be for your future you realize you have left the past behind and you focus on the future. And see yourself now in that future living a very powerful, wonderful, beautiful life. See yourself in that very active future, that very wonderful future, that’s right. And you realize that whatever you focus on you will obtain, so you focus now on a beautiful, wonderful future and see yourself in the future. See yourself happy, that’s right. Letting go of the past, moving toward the future, realizing that this moment is a vehicle to your wonderful, happy future, yet even in this moment you are happy because you are moving forward, moving forward, leaving the past behind, feeling better and better everyday. Everyday you will discover a new and wonderful and powerful aspect of yourself and this makes you so happy as you continue now to relax and unwind and just drift deeper and deeper and more deeply relaxed. Getting over a lover can be very difficult, but hypnotherapy will help you through the process. It takes time and constant effort to move forward with your life, but the Getting Over A Lover Hypnosis MP3 audio will make it much easier on you. This powerful hypnosis session focuses on your future and will help you move on with your life. Before using this recording, you are probably focusing on the past. The Get Over a Lover hypnotherapy MP3 will help you focus on a better, brighter, and more positive future that you deserve. There is a reason why you are not with your lover anymore. Whether it was in your control or not, what happened is for the best. Take this time to realize that you now have an opportunity, not a loss. This hypnosis program will give you the strength and control to overcome your emotional and physical attachment to your past lover. Letting go of your past love will help you move on now and in the future. You have an exciting life to live and you deserve to be happy. This powerful hypnotherapy recording will help you realize this and help you move on from a past love. We suggest you listen to the Getting Over A Lover Hypnosis MP3 session every night for 21 nights as you fall asleep. When listening, powerful suggestions will be targeted toward your subconscious mind to help you get over your lover.